As with the slate fountains, handcrafted marble wall fountains are expertly created from marble that is specially quarried and shipped from India. The marble patterns are breathtaking and every stone is hand cut to perfection making each marble fountain a one-of-a-kind masterpiece. One popular option to pair the marble slab with copper framing that has a unique marble-like finish burned onto the copper one piece at a time. 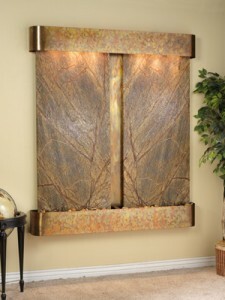 These marble wall waterfalls are available in a brown rainforest and green rainforest, or black spider marble with one, two, and three-panel options.